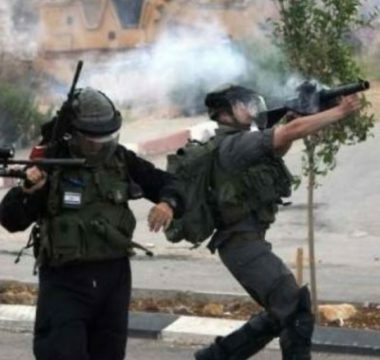 Dozens of Palestinian students and teachers suffocated after inhaling tear gas fired by Israeli forces toward an elementary school in Hebron, in the southern West Bank, said WAFA correspondence. Israeli soldiers fired a barrage of tear gas canisters toward an elementary school in the southern part of Hebron city, causing suffocation to dozens of students and teachers. They were all treated at the scene. To be noted, Palestinian schools in the southern part of Hebron, which is located in Area C of the West Bank, under complete Israeli civil and military control, are constantly subjected to systematic attacks by the Israeli army.